For the locality in England, see Portchester. For the port on the Delaware River, see Port of Chester. Port Chester is a village in Westchester County, New York, United States. The village is part of the town of Rye. As of the 2010 census, Port Chester had a population of 28,967. 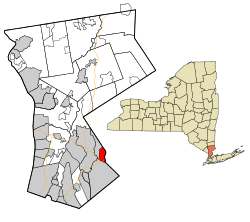 Port Chester borders on the State of Connecticut to the east. The village's name is pronounced with the same stress pattern as the county's, i.e., "PORT ches-ter", not "Port CHES-ter". Port Chester is one of only 12 villages in New York still incorporated under a charter; the other villages either incorporated or reincorporated under the provisions of Village Law. The Bush-Lyon Homestead, Capitol Theater, Life Savers Building, Putnam and Mellor Engine and Hose Company Firehouse, St. Peter's Episcopal Church, and United States Post Office are listed on the National Register of Historic Places. In 1660, three settlers from Greenwidge (now Greenwich, Connecticut), Thomas Studwell, John Coe, and Peter Disbrow, arranged to buy Manursing Island and the land near the Byram River from the Mohegan Indians. The land that they bought is now Port Chester. The village was originally known as Saw Pit for the saw pits in use during the time. Logs were cut in holes in the ground for wood to be used for shipbuilding. The name Sawpit was used for the first time in 1732. The village eventually outgrew this name and became Port Chester by incorporating as a village in 1868. When Port Chester was first incorporated, it was considered a major seaport. In 1665, Sawpit was claimed by both New York and Connecticut, but Connecticut gave the land to the New York Colony in 1683. The struggle over the ownership of Sawpit continued for almost 105 years. In 1788, the Legislature of New York ruled that Sawpit was a part of the town of Rye, New York. Travel was considered dangerous in Sawpit's early years as good roads were hard to find. The Boston Post Road, King Street, and Grace Church streets are some of the early migration paths in the Sawpit/Rye settlement. Other roads were usually dirt, making water transportation important. The local waterways, the Byram River and Long Island Sound, were a key part of the growth and development of Sawpit/Port Chester. Early residents took part in boat building, farming, and shell fishing. As of the census of 2010, there were 28,967 people, 9,240 households, and 6,348 families residing in the village. The population density was 11,722.5 people per square mile (4,526.1/km²). There were 10,046 housing units at an average density of 4,185.8 per square mile (1,646.9/km²). The racial makeup of the city was 31.6% White, 5.3% African American, 0.2% Native American, 2.0% Asian, 0.0% Pacific Islander, 0.7% some other race, and 0.9% from two or more races. Hispanic or Latino of any race were 59.4% of the population. There were 9,240 households out of which 33.9% had children under the age of 18 living with them, 46.5% were headed by married couples living together, 14.3% had a female householder with no husband present, and 31.3% were non-families. 24.2% of all households were made up of individuals and 10.0% had someone living alone who was 65 years of age or older. The average household size was 3.08 and the average family size was 3.54. In the city the population was spread out with 22.6% under the age of 18, 9.6% from 18 to 24, 34.2% from 25 to 44, 22.7% from 45 to 64, and 10.6% who were 65 years of age or older. The median age was 34.4 years. For every 100 females, there were 110.3 males. For every 100 females age 18 and over, there were 111.4 males. At the 2000 census, the median income for a household in the village was $45,381, and the median income for a family was $51,025. Males had a median income of $32,848 versus $32,461 for females. About 10.1% of families and 13.0% of the population were below the poverty line, including 15.3% of those under age 18 and 12.6% of those age 65 or over. Port Chester contains a more diverse, working-class population than many of its surrounding communities. According to the United States Census Bureau, the village has a total area of 2.5 square miles (6.5 km2), of which 2.4 square miles (6.2 km2) is land and 0.1 square miles (0.26 km2), or 5.22%, is water. Port Chester has a humid subtropical climate (Cfa). Due to its location on the coast, temperatures don't get extremely cold or warm and precipitation is plentiful for the entire year. Winters are usually cool and powerful nor'easters can occur, sometimes dropping large amounts of rain and snow on the village. Average annual snowfall is 27.2 inches, which is significantly more than New York City's 20.3 average inches. Snow cover is sporadic as the sea moderates temperatures, which melt snow. During the summer, Port Chester is typically warm, however is far cooler than towns even a few miles inland due to the moderating influence of the sea. Abendroth Park: a 10.1 acre park which includes a newly renovated section for dogs. Columbus Park: a 9.4 acre park located east of Ryan Avenue, west of I-95, and north of Fox Island. This park has one basketball and two volleyball courts, one large and one small playground, one picnic pavilion with picnic grills, a seasonal water spray playground, and an artificial turf soccer field. Bathroom facilities are available on-site. Crawford Park: owned by the town of Rye. The park is used for soccer, tee-ball, and softball by the village. Edgewood Park: a 3.2 acre park with one youth baseball field and small playground structure. Joseph Curtis Recreation Park: a 7.5 acre park located north of the Village’s downtown, not far from Lyon Park. The park is bounded by Putnam Drive on the west, Locust Avenue on the east, and Willett Avenue from the wouth. The park has a small playground structure, one adult size baseball field and batting cage, one roller skating rink, and BOCCE courts with fencing and lighting. Bathroom facilities are available on-site. Lyon Park: a 20.3 acre park that contains two Little League fields, a playground, and the historic Bush-Lyon Homestead. The park is bounded by Putnam Avenue, King Street, and Parkway Drive. The Life Savers Candy Company operated a factory in Port Chester from 1920 until 1984. The factory building, which now contains apartments, is one of Port Chester's prominent landmarks. National Collector's Mint is headquartered in Port Chester. Port Chester is the home of the chili restaurant Pat's Hubba Hubba (also known as "Hubba's"). The Bee-Line Bus System provides bus service to Port Chester on routes 13 and 61. Connecticut Transit Stamford Division provides bus service to Port Chester on routes 11A and 11B. The 13 was combined with the southern portion of the 76 on December 31, 2011. Metro-North Railroad's Port Chester train station is located on the New Haven Line, and thus provides commuter rail service to Grand Central Terminal in New York City, and to Stamford Transportation Center and New Haven-Union Station in Connecticut. Port Chester's government comprises a mayor and six trustees. The board and mayor also employ a professional village manager. Local Elections in Port Chester occur in March. As part of a 2009 Justice Department consent decree,[when?] Port Chester employed Cumulative Voting for trustee positions. The decree expired in 2016 and the Village is exploring voting options for elections scheduled for March 2019. The mayor continues to be elected At Large. The village of Port Chester is protected by the Port Chester Fire Department (PCFD), established in 1823 and formally incorporated in 1856. PCFD is 100% volunteer. Volunteer members operate an apparatus fleet of 5 Engines, 3 Fire Chief's Vehicles, 1 Ladder, 1 Tower Ladder, 1 Heavy Rescue, 1 Utility Unit, 1 Transport Bus, 1 Fireboat, and 1 Mass Decontamination (Decon.) Support Unit, all operating out of 4 Fire Stations. The current Chief of Department is Enrico Casterella (Jan 2019 - Jan 2021. The Port Chester Fire Department had previously employed 8 career firefighters, who were laid off by the village in 2015. The United States Post Office (Port Chester, New York) is an historic post office building located on Westchester Avenue. It was designed by consulting architects Zoller and Muller for the Office of the Supervising Architect, built in 1932-1933, and listed on the National Register of Historic Places in 1989. It is a one-story symmetrical building faced with brick and trimmed in limestone and granite in the Colonial Revival style. The front facade features a projecting central pavilion with a shallow portico composed of two pairs of limestone Corinthian columns echoed by Corinthian pilasters. The lobby features an array of four large New Deal murals and nine slightly smaller lunettes, designed by Domenico Mortellito with Treasury Relief Art Project (TRAP) funding, and installed in 1936. They depict a wide range of human activities from fire fighting and ship building, to baking, iron working, medicine, music, and teaching. Within the city's borders, there is one public school district, the Port Chester-Rye Union Free School District. Established in 1884, it is the oldest school district in Westchester County. At one time the Westchester Fairfield Hebrew Academy (now Carmel Academy) was in Port Chester. It opened in Port Chester in 1997, in rented space. The Japanese Weekend School of New York, a hoshū jugyō kō (Japanese weekend school), holds classes at Port Chester Middle School. As of 2006, the school had about 800 students, including Japanese citizens and Japanese Americans, at locations in Westchester County and Long Island. The Capitol Theatre is located in Port Chester. On June 30, 1974 an infamous nightclub fire killed 24 young men and women. The fire at Gulliver's was the deadliest dance club fire in the United States in more than a generation (the Cocoanut Grove fire in Boston, on November 28, 1942, had killed 491, and the Happy Land fire in the Bronx, on March 25, 1990, was to kill 87), and it called attention to the dangers of herding young people into windowless underground rooms without smoke alarms, sprinklers, fire-resistant walls, or limits on occupancy. Despite the tragedy of Gulliver's, comprehensive New York State Fire Code reform would not be seen until the 1980s. Fire code enforcement continues to be a top priority in Port Chester to this day. To enforce the Voting Rights Act of 1965, the United States Department of Justice brought a lawsuit in 2006 to compel the village government to change from an allegedly racially discriminatory at-large electoral system to one that was district-based. This lawsuit would halt the scheduled March 2007 elections until the village develops an acceptable plan. In its December 15, 2006 complaint the Justice Department alleged that, "the current at-large system for electing members of the Port Chester Board of Trustees results in Hispanic citizens having less opportunity than white citizens to participate in the political process and to elect candidates of their choice to the Port Chester Board of Trustees." (United States v. Village of Port Chester 6 Civil 15173) Local Latino activist Cesar Ruiz, NYS Assemblyman Peter Rivera and Angelo Falcón, President of the National Institute for Latino Policy held a news conference on Martin Luther King, Jr.'s birthday (January 15, 2007) to display support for the Justice Department's lawsuit and the need to reform the village's electoral system. 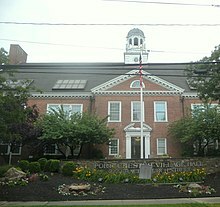 The Village Board of Trustees passed a resolution on December 4, 2006, expressing its disagreement with the Department of Justice's decision that the village must reform its election system, claiming that the problem was not discrimination but rather "apathy" in the Hispanic community. Federal authorities believed that the village's "at large" voting system denied Hispanics representation on the board of trustees and the board of education. According to Reuters, "All voters in town elect each board member, whereas dividing the town into six electoral districts would give Hispanics a majority in at least one of them because they are largely concentrated in one area of town, the suit said." Although Latinos make up a significant portion of Port Chester's population, no Latinos had ever been elected to their Board of Trustees or local school board. On March 2, 2007, federal court judge Stephen C. Robinson ruled in favor of the Department of Justice and placed an injunction on the March trustee elections scheduled to take place. This ruling did not affect the mayoral election, but it was expected to result in Port Chester being broken down into election districts. Instead, village officials came up with an alternative plan to address the problem by using cumulative voting. This plan was approved by the federal judge on November 6, 2009. In 1999, the Village of Port Chester established a "redevelopment area" and relegated regulatory authority within that area to private developer Gregory Wasser (from G&S Port Chester, LLC), including power to condemn private property. The decision has spawned several lawsuits, including Brody v. Village of Port Chester, and Didden v. Village of Port Chester. ^ a b c d "Profile of General Population and Housing Characteristics: 2010 Demographic Profile Data (DP-1): Port Chester village, New York". U.S. Census Bureau, American Factfinder. Retrieved November 18, 2011. ^ "Local Government Handbook – Village Government: Historical Development" (PDF) (5th ed.). New York State Department of State. 2008. pp. PDF page 72. Archived from the original (PDF) on 2009-03-26. Retrieved 2009-06-26. ^ Berger, Joseph (2010-07-22). "Enjoying a Mix of Latin Cultures and Local History". The New York Times. ^ "Bee Line Bus Route 76 Cut". Daily Voice. Port Chester, New York. ^ "Portchester High School" (PDF). Portchester Schools. ^ "Port Chester-Rye Union Free School District". usnews.com. ^ Hagey, Keach (September 18, 2006). "JEWISH SCHOOL GAINS ITS OWN PLACE". Fort Lauderdale Sun Sentinel. p. 6A. Retrieved January 10, 2012. ^ "ウエストチェスター校" [Archive: Japanese Weekend School of New York]. Japanese Weekend School New York. Archived from the original on January 18, 2014. Retrieved July 8, 2013. ^ Akiko, Matsuda (August 16, 2006). "Learning their mother tongue". The Journal News. p. A1. Retrieved July 8, 2013. Atsushi Kaizuka, assistant principal of the Japanese Weekend School of New York, which serves about 800 Japanese or Japanese American students at its Westchester and Long Island schools, said Matthews' attempt seemed to be an uphill battle. ^ Berger, Joseph (July 1, 1999). "25 Years Later, Disco Fire Haunts Its Survivors". The New York Times. ^ "Port Chester, New York Manager" (PDF). virtualtownhall.net. ^ Fitzgerald, Jim (November 6, 2009). "US judge selects cumulative voting to protect Hispanics' rights in NY village's elections". Minneapolis Star-Tribune. Retrieved 2010-01-09. ^ Forbes Magazine, "The Taking of Port Chester", accessed 2009-07-17. ^ Detroit Free Press, "Eroding constitutional limits on governmental takings", accessed 2009-07-17. ^ Didden v. The Village of Port Chester (Summary Order), 2nd Circuit Court of Appeals (April 05, 2006). Accessed 2009-07-17. ^ Edmeka.com, "N.Y. Eminent Domain Fight Appealed to the U.S. Supreme Court", accessed 2009-07-17. Wikivoyage has a travel guide for Port Chester.